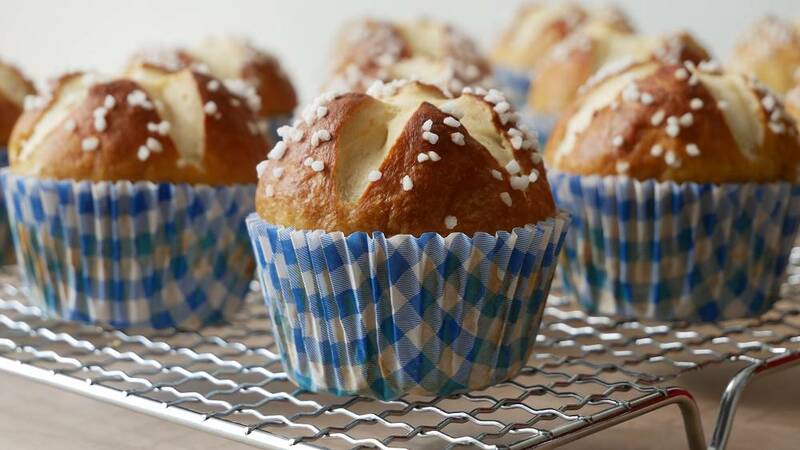 Pretzel muffins are small rolls dipped in lye for a few seconds & baked in a muffin pan. When baking, they get the brownish-shiny surface that is typical for lye pastries, whereby the lye remains only on the dough surface & does not soak into the muffins. 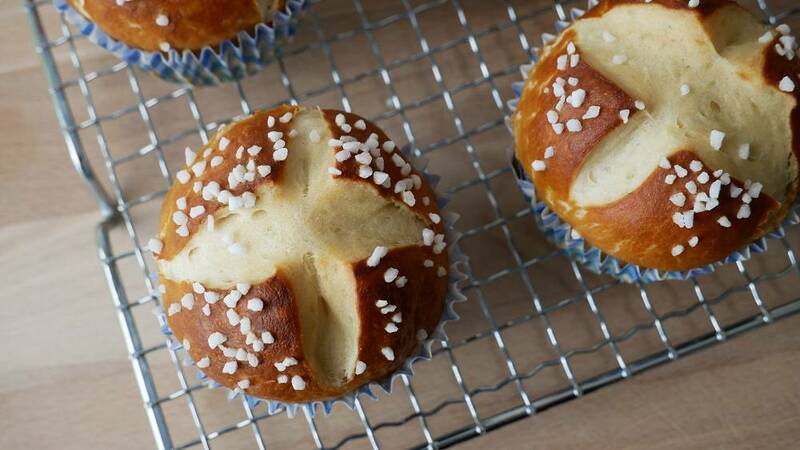 In addition to pretzel muffins, the following recipe also makes it easy to bake lye sticks, lye rolls or pretzels. Have fun baking! Crumble 20 grams fresh yeast into a high container, add 1 teaspoon sugar & 200 milliliters lukewarm water & stir together with a whisk or fork until yeast & sugar have completely dissolved. 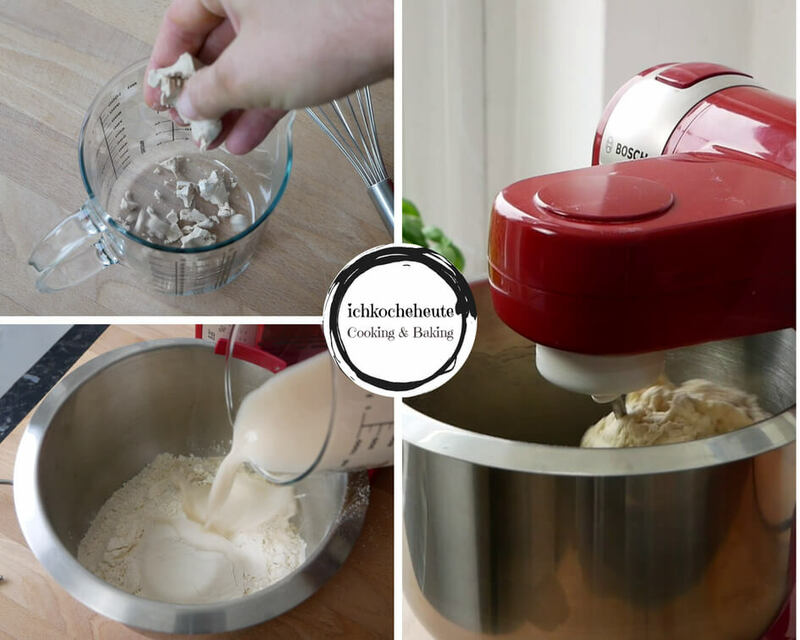 Next, in a mixing bowl combine yeast-water mixture along with 400 grams flour, 50 grams soft butter & a teaspoon salt & knead with a kitchen machine or mixer with dough hook for about 4 – 5 minutes until a smooth dough. Then give the dough a ball shape with your hands, lay it back to the mixing bowl & allow to rest covered with a kitchen towel for about 45 minutes in a warm place until the dough volume has approximately doubled in size. Line a muffin pan with paper cases or grease with a little butter. After 45 minutes thoroughly knead the dough again on a countertop & then use a knife to cut the dough into 12 equal sized pieces. Round each dough piece with circular movements under your palms until you got small balls & allow them to rest for another 10 – 15 minutes. Meanwhile preheat the oven to 200°C (top/bottom heat) & also heat up a large pot with 1,5 – 2 liters of water on the stove. As soon as the water simmers (that’s just before cooking), turn off the heat and gradually add 50 grams of soda to the water. Next, let the prepared dough balls slide into the water one after the other & allow them to float for about 30 – 45 seconds, while turning them once. Carefully lift the dough balls out of the water with the help of a skimmer & place them into the lined muffin pan. Cut the pretzel balls surface crosswise with a sharp knife, then sprinkle the top with a bit coarse salt and bake in a preheated oven for about 15 – 20 minutes until brown & shiny. 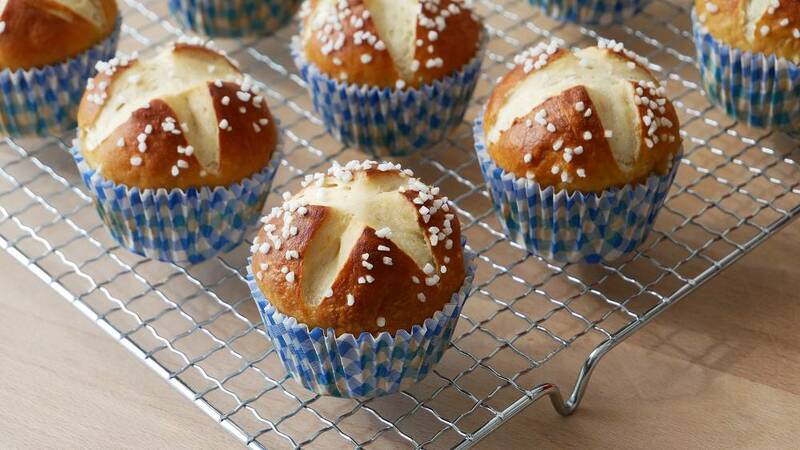 Get the done pretzel muffins out of the oven, allow to cool slightly and then serve still warm. I wish you lots of fun baking!